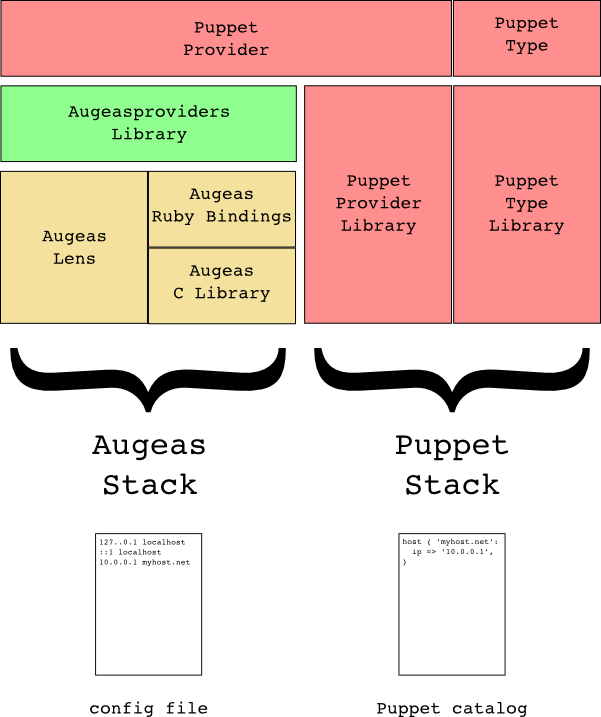 The augeasproviders library is a helper Ruby library to write Puppet providers allowing to manage files in parts, using Augeas. This page describes the steps to create a provider using the augeasproviders API. The first thing you need is a Puppet type. It could be an existing type or a new type. have a target parameter, specifying which file to manage. desc "Uses Augeas API to update my file"
This method takes a block which is interpreted when the default file is needed. Consequently, you can use code in the block, basing yourself on informations such as facts (using the facter API) to determine the default file. The default file path will be used to declare a $target Augeas variable, which you can then use in your Augeas paths whenever needed. Again, the block is interpreted down the road so you can use code in this block. These two methods can be overridden in your provider if you need a more advanced behaviour. The resource_path method is also used to define a $resource Augeas variable, which you can use in your Augeas expressions, alongside the $target variable. When defining your provider methods, you will need to manipulate the Augeas tree. augeasproviders provides two useful methods for this: augopen and augopen! The augopen method will open Augeas with your file/lens combination alone (making it faster), safely manage Augeas errors, and close the Augeas handler at the end of the block. Again, the define_aug_method! method will save the tree, while define_aug_method will not. define_aug_method lets you define generic methods for your provider. For ensurable types, properties need two methods, for getting and setting the property value respectively. The Augeasproviders library helps you to do that by providing property accessor methods. This will manage a property called foo, whose value is stored as the value for the foo node of the $resource node. These calls produce dynamic methods, named after the property you wish to control. In this case, they will be named respectively attr_aug_reader_foo and attr_aug_writer_foo. The standard ensurable methods foo and foo= are then automatically defined using these respective methods. The case where a resource property maps directly to a sub-node in the tree with the same name and a simple value is not always met. For more complex situations, the accessor methods accept a series of options. Augeas has two ways of representing array values in its trees, using either fix labels or sequential entries (see this page for an explanation of why both of them exist). In all cases, all existing values are purged before setting the target values. In the Augeas tree, hash values are represented by sub-nodes, with optional values (the :sublabel option is used to set the value node name). When no value is found in the tree, the accessor method will default to the value of the :default option. Note that only one level of hash depth is currently supported.